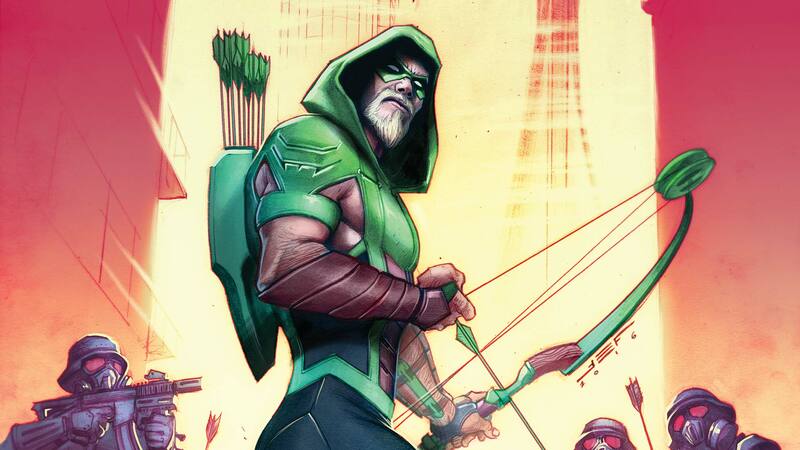 SPOILER ALERT: The below feature contains major spoilers from this week’s issue of Green Arrow. Don’t scroll any lower if you still haven’t read it! Seattle’s a great city, but in the pages of this week’s GREEN ARROW #15, it’s also a city under siege, and the one man who can help has seen his life destroyed and his reputation tarnished. Much of it has been at the hands of Queen Industries CFO Cyrus Broderick, who orchestrated Oliver’s professional and personal downfall. Now the shaken hero finds himself questioning his entire mission in life at the start of Benjamin Percy and Juan Ferreyra’s action packed issue. Threatened on all sides by a frightening array of adversaries, Ollie’s usually unwavering belief in the Green Arrow is in pieces—and who can blame him? How can one man save a city that seems determined to destroy him and everything he loves? That would be hard enough even on his best day, and this is not Oliver’s best day. Where does he even start? He starts with what he knows to be true: his love for Dinah Lance and her belief in him. With Black Canary and John Diggle’s help, Green Arrow finds the strength to confront the most immediate threat to Seattle. A gang of brutal vigilantes led by the disgraced former Seattle Police Department Sergeant Notting, someone who’s had run-ins with Green Arrow before. Calling themselves “The Vice Squad,” Notting’s new team sees itself as Seattle’s self-proclaimed judge, jury and executioner. When the word gets out that the Squad has attacked the county jail, our heroes spring into action and not a moment too soon. But don’t think for a moment that Notting is down! The sinister Squad leader is driven by an angry will and a determination to never again fall at the hands of Green Arrow. Aided by a couple of armed companions, he takes down Chief Westberg and is about to take out Green Arrow when Ollie gets an unexpected assist. Well, at least Notting wasn’t beaten by Green Arrow. But with the return of Emi and her adoption of the Red Arrow mantle, could our heroes have finally turned the corner in their fight for Seattle? We’ll have to see when Green Arrow returns on February 1st!